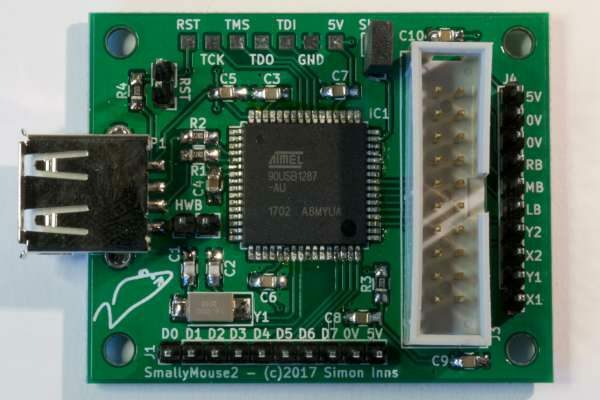 SmallyMouse2 is a universal USB to quadrature mouse adapter for many 8-bit and 16-bit retro computers and allows the use of modern USB mice on machines such as the Acorn BBC Micro, Acorn Master, Acorn Archimedes, Commodore Amiga, Atari ST and many more. Unlike most existing mouse adapters, SmallyMouse2 implements a fully USB compatible interface (most current adaptors are PS/2 based) this allows the use of any modern mouse including those that use wireless communications. Project files are available at GitHub. This entry was posted on Tuesday, June 6th, 2017 at 3:05 pm	and is filed under AVR, USB. You can follow any responses to this entry through the RSS 2.0 feed. You can skip to the end and leave a response. Pinging is currently not allowed.